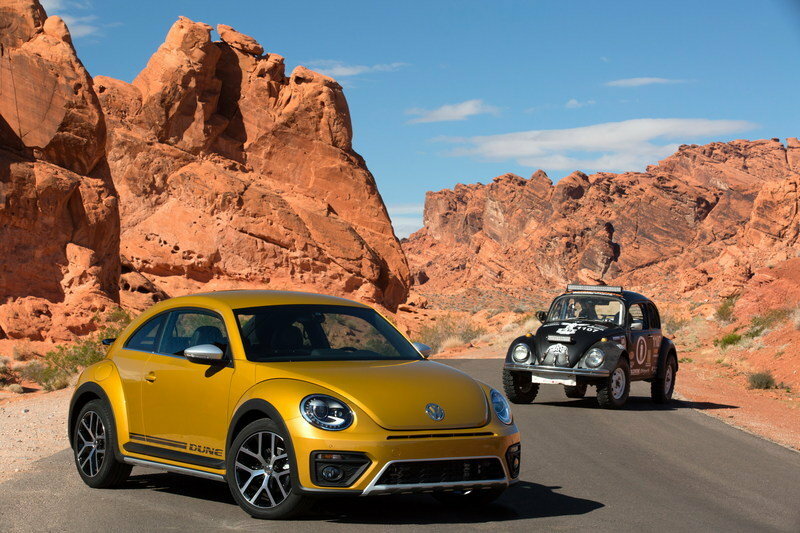 To look at the original Beetle in stock form, it probably doesn’t strike you as much of an off-road vehicle. But there was a time when the Beetle was a popular choice for off-road duty. It was cheap, light and easy to work on. Beetles were raised, fitted with off-road tires, and had their bodywork removed, cut or often replaced with fiberglass pieces that allowed for extra lights. These “Baja Bugs,” as they would come to be called, would become so popular that the Baja 1000 race would include a whole class just for the modified Beetles. 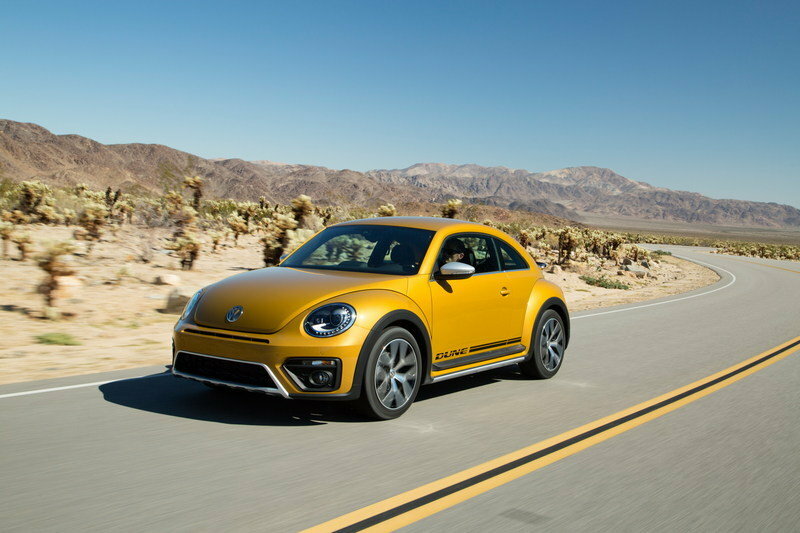 Newer Beetles, defined as any with the engine in the front, don’t take to off-road duty quite as readily as their predecessors, but Volkswagen will still be paying tribute to the old Baja Bugs with a new special edition for 2016, called the Beetle Dune. The car is a production version of the 2014 Dune Concept that was shown in Detroit, and that was itself an update of a concept from all the way back in 2000 based on the New Beetle. The special edition isn’t an actual off-roader itself, but it doesn’t look as though VW is trying to trick anyone into thinking it is. 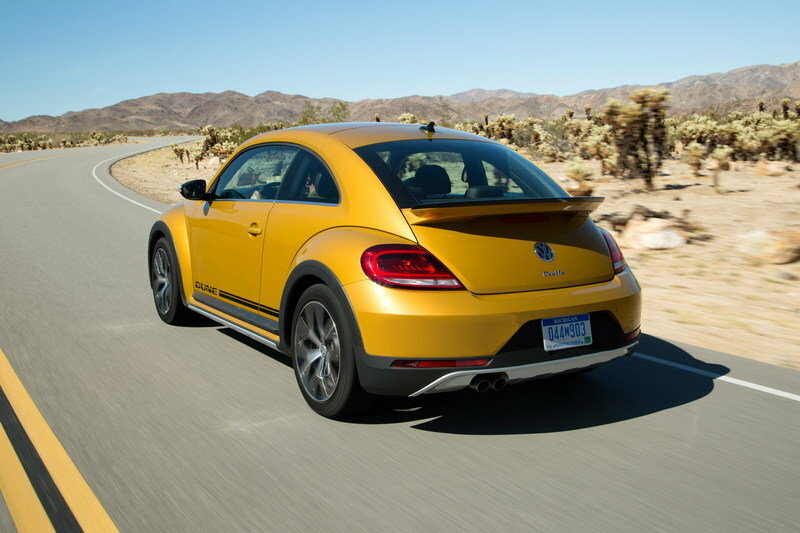 Continue reading to learn more about the 2016 Volkswagen Beetle Dune. 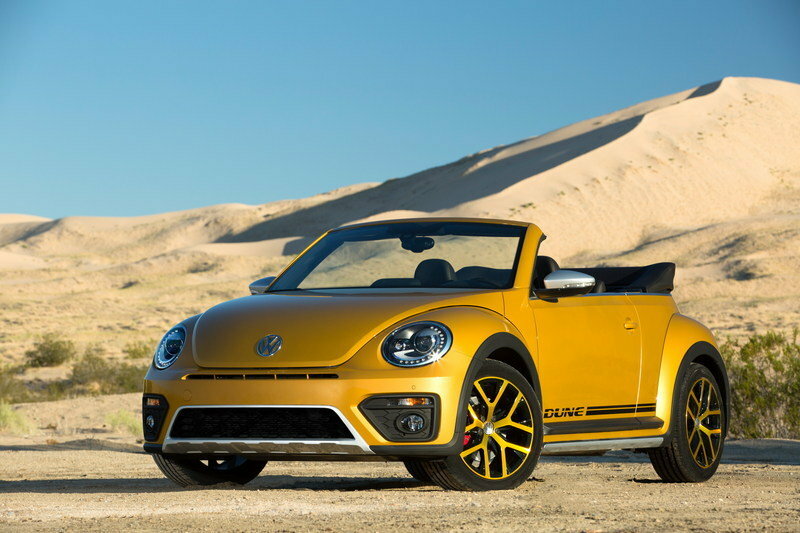 The looks of the Dune are meant to evoke the memory of the Baja Bugs without too drastically altering the body of the standard Beetle. So the ride height has been raised, but not so much as it was in concept form. On the production car it totals 0.4 inches. Like the concept, there is black trim around the bottom of the body and around the wheel arches. The running boards were removed and the fenders were cut away in order to make the bigger tires fit. This is to simulate negative space, as on the original cars, the running boards were removed and the fenders were cut away in order to make the bigger tires fit. It might not be entirely convincing, but it doesn’t look bad, so there’s no harm in it. There are “Dune” graphics on both sides, and silver trim pieces around the bottom of the car. The press release makes the bold claim that “the rear diffuser also acts as a skid plate,” which…. no it does not. It does look like a skid plate though, and this is really the point. The front fascia has been reworked. Part of this is due to the grille surround and mock skid plate, but the grille is also a different shape. The fog lights are now surrounded by a black honeycomb mesh and there are bi-Xenon headlights and daytime running lights offered as an option as well. It has a set of 18-inch Canyon wheels and a good-sized spoiler around back. It is offered in Sandstorm Yellow (the color you see here), as well as black or white. Like all Beetles, the dash and door panels in the Dune are painted to match the body color, unless you get a white one, then they’re painted black. 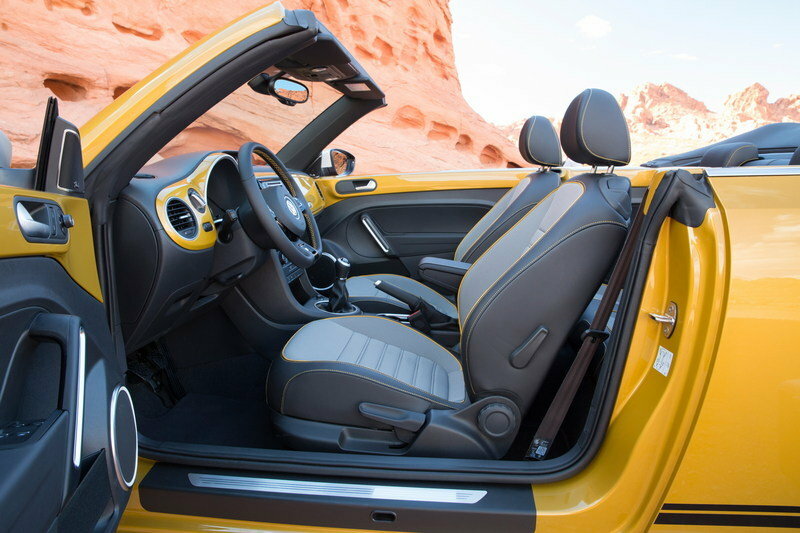 On the inside, the Dune gets sport seats with orange stitching, as well as matching stitching around the steering wheel and shifter boot. The car comes with VW’s latest MIB II infotainment system, complete with a 6.3-inch touch screen and gesture controls. There is also an optional package that gives you dual-zone climate controls, an upgraded Fender audio system and a sunroof. There are some stories about old Baja Bugs having their engines pulled and replaced by Porsche engines. They wouldn’t fit under the engine covers, but since those were usually removed on the Bajas, it didn’t really matter. Unfortunately, VW isn’t being nearly as ambitious with the Dune. The drivetrain in the Dune is unchanged from the standard Beetle. The drivetrain in the Dune is unchanged from the standard Beetle. 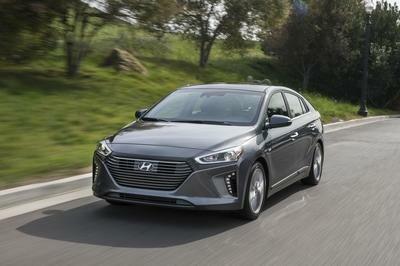 That means a 170-horsepower 1.8-liter turbocharged four-cylinder engine. 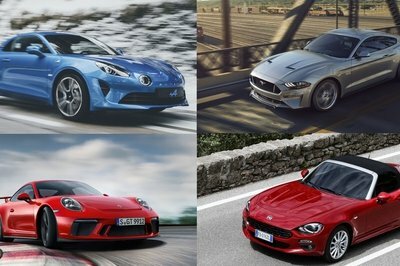 The press release suggests that it is only available with a six-speed automatic transmission, but the pictures of the interior show three pedals and a manual shifter, so it’s not entirely clear what’s going on there. And even though the original 2000 Dune concept had all-wheel-drive, the production version only sends power to the front wheels. 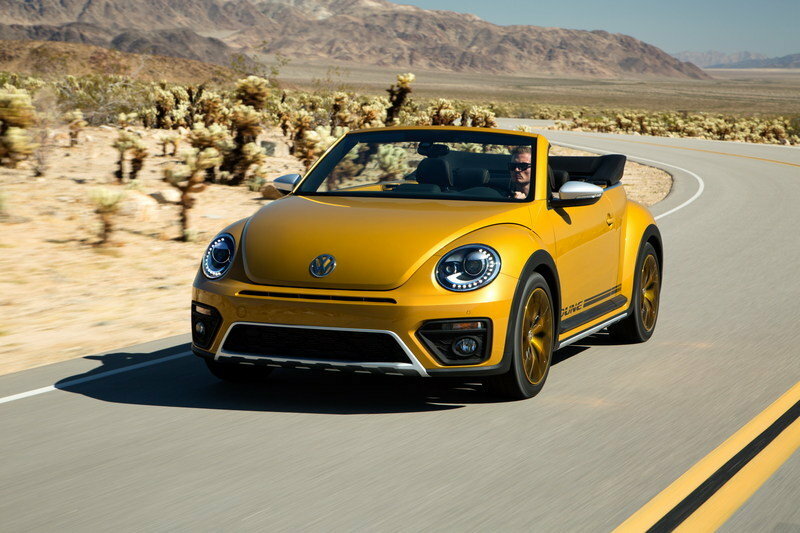 Volkswagen didn’t release pricing information yet, but since we have pricing for the rest of the Beetle lineup, we can make some educated guesses. Beetles with the 1.8 engine start at about $20,000 and go up just past $25,000. At that point, you’re starting to get into the pricing territory of the 2.0-equipped Beetle R-Line. The Dune might well push push 1.8 pricing a bit higher, but only when fully loaded, base pricing will likely be a couple below that $25,000 threshold. We’ll probably learn more when VW is getting ready to start sending Dunes to dealerships in early 2016. 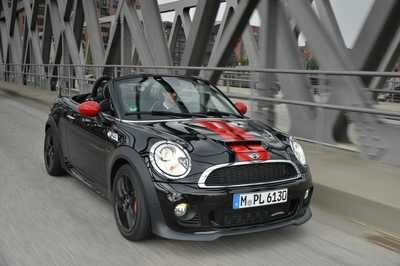 There will be a convertible version of the Dune as well, which will be arriving in the third quarter of 2016. Expect that to cost about $4,000 to $5,000 more than its hardtop equivalent. For a compact with a bit more crossover flavor to it, the Kia Soul is already a very popular choice. 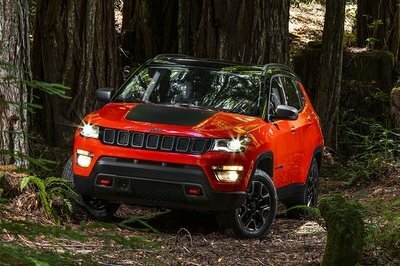 This is helped by the fact that it is noticeably cheaper than the Beetle, and the extra ground clearance helps with its crossover credibility. It’s probably not a good idea to take the Soul on any serious off-roading adventures either, but it is a sold value for the money. Probably a good part of the reason why it’s so popular. 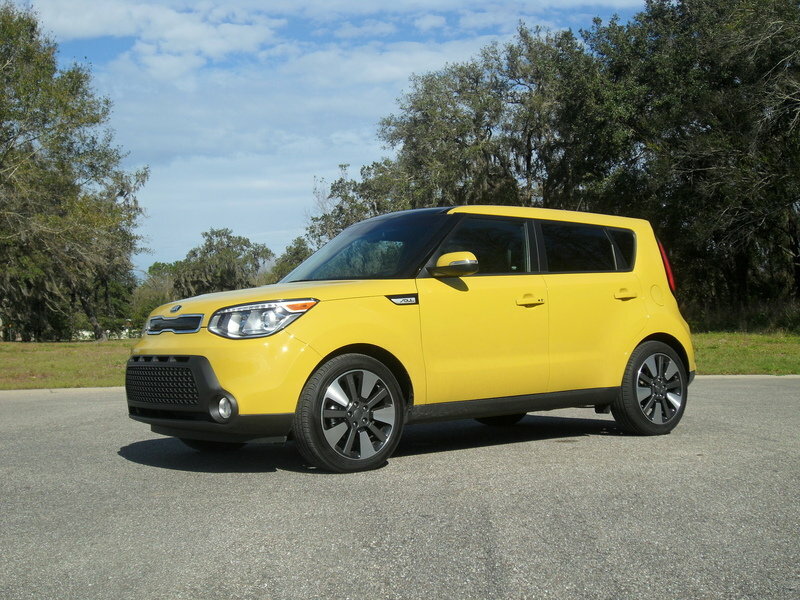 Read our full review on the Kia Soul here. The focus might not have the off-road looks of the Beetle Dune, but it does have two WRC manufacturer’s championships under its belt, which you could easily say counts for more. The Focus is also a blast to drive and costs less than a Beetle. 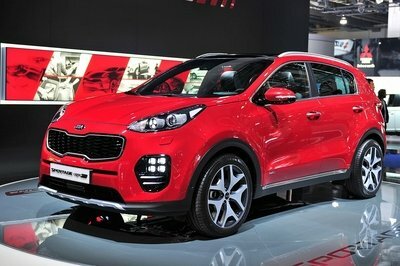 The downside is that, while it is an attractive car, the looks aren’t as interesting as those of some other compacts. 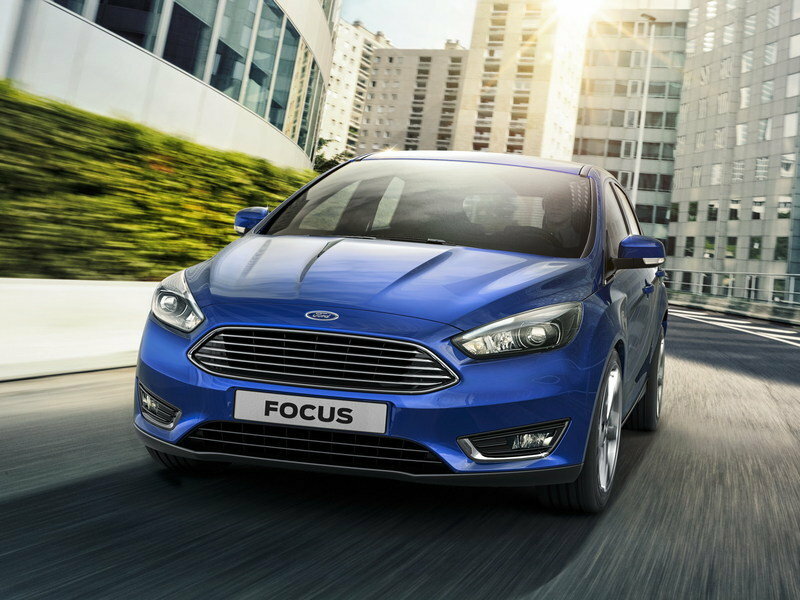 Read our full review on the Ford Focus here. It’s difficult to say whether or not anyone will really be disappointed by the Dune’s lack of off-road capability. Chances are that nobody who was familiar with the original Baja Bugs was going to be holding out any hope that VW would turn this version into something for actually taking on real dunes. This does raise the question of who exactly the car is for, this off-road-themed car that doesn’t go off-road. It does fit with the Beetle’s general nostalgia vibe, but one can’t help but wonder if it might have gotten a little too specific. Still, the extra equipment isn’t a bad thing, and so long as the price is reasonable, there’s no specific reason not to buy one. So if you like the look of the Dune, I say go for it.